Flickr Photo by Scatman Otis / The Georgia Theatre is seen in Athens, Ga.
Saturdays in the South are truly something to behold. Each week, college towns below the Mason Dixon fill with fans from across the region, exuding a contagious energy that's palpable the minute you roll on campus. Even if you aren't a fan of either team on the field, or football in general, there's truly something for everyone to make for a weekend you won't forget. Here's a roundup of things you don't want to miss in Athens, Auburn, Knoxville, Nashville and Tuscaloosa. Often regarded as one of the best college towns in the country, Athens is a hotspot for music, culture and fun. Delicious Latin American food, funky decor and outdoor ambiance make Cali-N-Tito's ($, 1427 S Lumpkin St) a go-to for inexpensive, relaxed dining. Located within walking distance to the UGA campus, Cali-N-Tito's is BYOB and cash only so make sure to bring your own six pack and some crisp dollar bills. For a more upscale dining experience, Last Resort Grill ($$; 184 W Clayton St) has been the place to go for 20+ years. Centrally located downtown in a former music club, Last Resort features Southwestern-inspired food with a Southern twist, sourcing ingredients from local vendors for a true farm-to-table taste. Everything here is good but the Cowgirl Chicken is a popular dish for a reason and the Caramelized Sea Scallops will melt in your mouth. For prime tailgating on the day of the game, head to historic North Campus where you'll surely be charmed by the beautiful Greek Revival architecture, well-tended gardens and towering old trees. North Campus too packed? No worries. Simply walking up and down the streets of Athens charismatic downtown is just as fun with countless bars, stylish boutiques and prime people watching. To say that Athens has no shortage of nightlife is an understatement. The streets of downtown are lined with everything from dive bars to upscale cocktail lounges. Start off with the historic Georgia Theatre (215 N Lumpkin St), a music venue and event space that has hosted countless local and national acts ranging from the B-52's and The Police to Willie Nelson and Kenny Chesney. Rebuilt after a fire devastated it in 2009, Georgia Theatre now boasts a rooftop bar with top notch views of downtown Athens. For a more relaxed vibe, hop across the street to The Globe (199 N Lumpkin St). Previously named one of of the Best Bars in America by Esquire magazine, The Globe is a funky, Irish-style pub with an extensive selection of wine, beer, spirits and deliciously hearty food items. They also have complimentary bread and cheeses in the late afternoons so if that doesn't get you there I don't know what will. If you have the time, make the short trip to the State Botanical Garden of Georgia. Just 3 miles south of campus, the garden is a stunning 313-acre preserve with multiple themed gardens, nature trails and more. If you're a plant nerd, check out the tropical conservatory, making sure to bring a handkerchief for your drool. Nestled in the idyllic farmland of middle Alabama, Auburn is the epitome of Southern charm and unique SEC traditions. For mouth-watering ribs, traditional Southern brunswick stew and delectable pork sandwiches, look no further than Byron's Smokehouse ($; 436 Opelika Rd). An Auburn landmark since 1989, Byron's serves the best barbecue and fixins in town and has the perfect fare for eating in or taking to the tailgate. In the mood for something a little more upscale? Hamilton's ($$; 174 E Magnolia Ave) has long been considered one of Auburn's finest eateries. Situated in Auburn's historic downtown, Hamilton's boasts an intimate atmosphere with a diverse menu featuring delicious contemporary American dishes sure to please even the pickiest of pallets. Auburn may be the smallest town on our list, but it offers a hopping nightlife one expects from an SEC town. Skybar Cafe ($; 136 W Magnolia Ave) is a collegiate favorite with live music, karaoke, cheap drinks and a rooftop deck to enjoy the autumn weather. Another popular spot nearby is 17-16 Bar, named after Auburn's iconic Iron Bowl win against Alabama in 1972. Featuring a large, wrap-around bar and a spacious, recently renovated back porch, 17-16 is often crowded but never cramped, making it a great place to party after a big game. Located right outside of the stadium between the Student Center and Parker Hall, the area nicknamed "Tent City" is the place to be for Auburn tailgating. For a seamless tailgating experience, check out the Tailgate Guys (tailgateguys.com), a local company devoted to helping you have the best experience possible, from unloading your car to providing the cooler with ice to setting up a flatscreen in your tent. 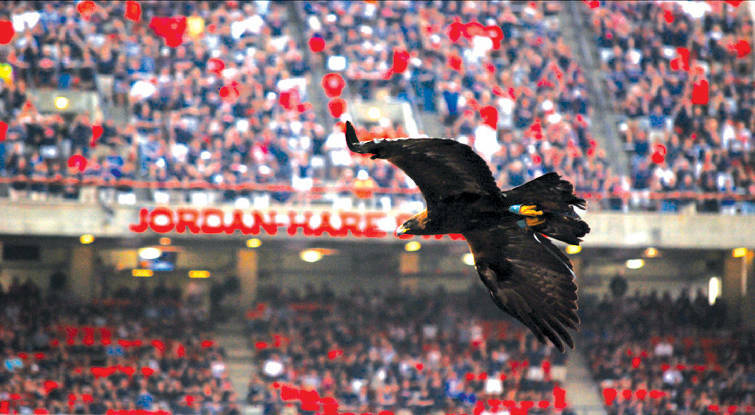 While the tailgate will be a blast, make sure to get into the stadium well before kickoff to see the War Eagle (yep, the actual bird) soar above the crowd for a truly unique experience. And the traditions don't stop when the game ends. If the Tigers win, head over to historic Toomer's Corner to watch as thousands of students and fans engage in the long-standing tradition of rolling the intersection after victories. Flickr Photo by Steve Parker / Scruffy City Hall is seen in Knoxville's Market Square. With its scenic river, bustling downtown, and colossal stadium, Knoxville undoubtedly puts the "big" in Big Orange. Located in a renovated old service station, Balter Beerworks ($$; 100 S Broadway) has been serving seasonal, made from scratch food since 2016. Sit outside and sip on a Balter original craft beer while indulging in a Beast Burger featuring pimento cheese, fried green tomato and a fried egg (mouth: watering) or stop by for a post-nap worthy brunch of Chicken & Waffles. It may come with a serious price tag, but J.C. Holdway ($$$$; 501 Union Ave) has the chops to back it up. Named one of the best new restaurants in the nation by several national publications, J.C. Holdway is the conception of Knoxville native Joseph Lenn, a James Beard Award winner and former executive chef at the luxurious Blackberry Farm. Specializing in wood-fire techniques, J.C. Holdway's menu consists of snack plates, smaller plates and larger plates along with an extensive wine, beer and spirits menu. A visit to J.C. Holdway isn't just for a phenomenal meal, it's for an unforgettable dining experience. Tennessee River. Even if you don't know someone in Knoxville with a boat it's still fun to watch from the top of one of the stadium's nearby parking decks. These days, downtown is the place to be for Knoxville nightlife. 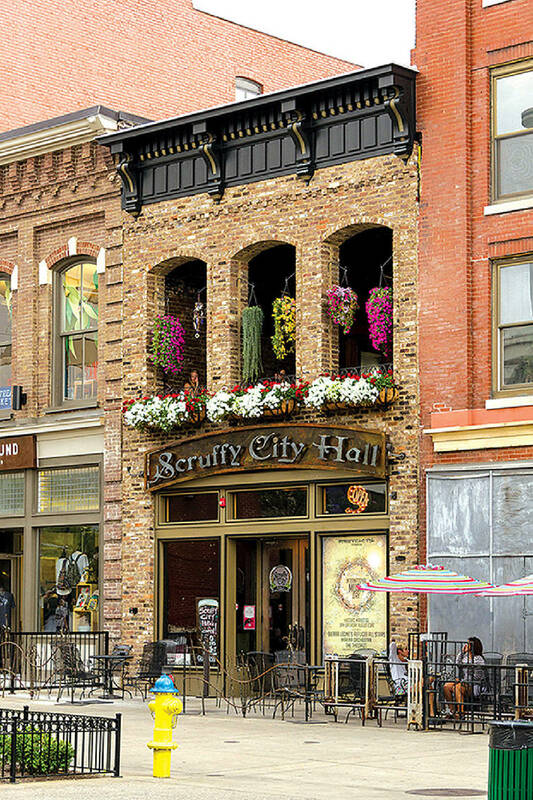 Check out Scruffy City Hall (32 Market Square) in Market Square, a three-story, artistic trip for the senses known as one of Knoxville's best music venues. With full bars on the first and second floors and a rooftop known as "the Scroof" that overlooks downtown, you're sure to have a night to remember. Need something a little more lowkey? Head over to Downtown Grill and Brewery (424 S Gay St) on historic Gay Street in the heart of downtown. The old hardwood floors and vintage images of Knoxville on the walls make for a relaxing place to enjoy one of their homemade craft beers brewed on site. Photo by Joseph Woodley / Hattie B's famous Hot Chicken is a Nashville staple. Not only is it one of the hottest and fastest growing cities in the country, Nashville is home to Vanderbilt, arguably one of the most beautiful campuses in the SEC with plenty to do in the surrounding area. 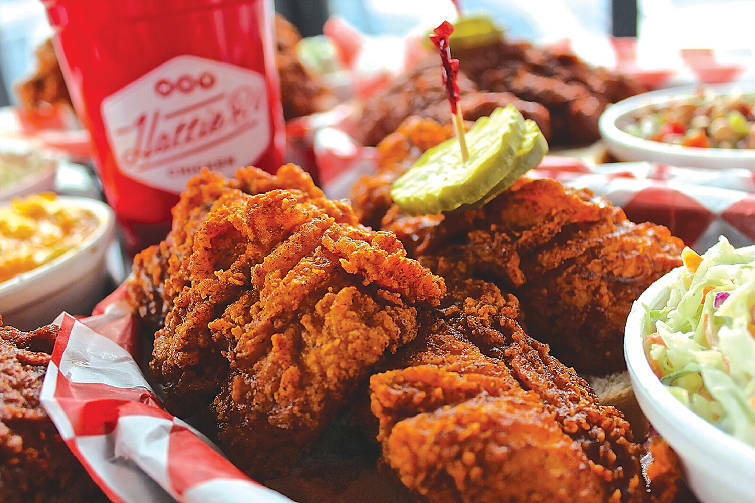 You can't talk Nashville food without talking hot chicken and for that, Hattie B's Hot Chicken (112 19th Ave S) is the place to be. Although the line is often out the door, it's simple, inexpensive menu is worth the wait for a true Nashville experience. Make sure you save room for dessert because their banana pudding is divine, a true local favorite. Hopdoddy Burger Bar is another great spot located just a mile south of Vandy's campus. Known for their burgers made with local, all-natural ingredients, Hopdoddy also has a range of salads, shakes and craft beers. If you go on a hot day, try their fresh-squeezed ginger lemonade for a refreshing pick-me-up. You won't regret it. Right in the middle of Nashville's trendy midtown and within walking distance from Vanderbilt and Music Row, Broadway Brewhouse is a popular local watering hole with an extensive selection of beers on tap. Now, beer is great and all, but I highly recommend ordering a Bushwacker instead, an alcoholic milkshake you'll be dreaming about for the foreseeable future. For those looking to feel like they're back in their college days, look no further than Springwater Supper Club and Lounge (115 27th Ave N). Known as the "oldest dive bar in Nashville," Springwater offers a regular lineup for local live music (Dierks Bentley got started here), billiards, darts and cheap, cold beers. How can you go wrong? Tailgating in Nashville revolves around Vandyville, a street-long party located on the corner of Jess Neely Drive and Natchez Trace outside Vanderbilt Stadium. Filled with reserved tents, kid-friendly games, local food vendors and a gigantic big screen, Vandyville is the place to be prior to kickoff. If you can tear yourself away from the party, take a stroll through Vanderbilt's historic campus. In addition to stunning architecture, the campus is also a designated arboretum featuring almost 200 species of trees and shrubs, some of which predate the Revolutionary War. Known for its powerhouse football program, Tuscaloosa also boasts a beautiful campus, great southern food, hopping nightlife and fun for the entire family. Featuring delightfully delicious food that isn't too pricey, Avenue Pub ($$; 405 23rd Ave) is newer to the scene but has been an instant hit. Nosh on the killer Bacon Burger for dinner and, for brunch, the Chicken Biscuit & Gravy is, according to my foodie friend, "blackout good." Known to the locals as Nick's in the Sticks, Nick's Original Filet House ($; 4018 Culver Rd) is another go-to spot unique to T-Town. Located a little outside of town with a middle-of-nowhere vibe, you'll feel like you're in on a local secret. A serious dive that's been around since before WWII, Nick's is also home to one of the best drinks in Tuscaloosa, the Nicodemus. It's tasty but beware, it packs a serious punch. For the best pre-game tailgating, look no further than the Quad. Centrally located on Alabama's beautiful campus, the Quad features food trucks galore, kid-friendly activities, meet and greets with former players and more. For information on parking and Quad rules, visit uagameday.com. Another gameday must is the Walk of Champions where you'll catch a glimpse of the players and the team's famous Coach Saban as they file into the stadium. Whether or not you care about Alabama football, you're sure to get caught up in the excitement and even find yourself screaming a Roll Tide of two. For the best, rowdiest gameday bar in town, go to Gallete's. A Tuscaloosa institution, Gallete's is conveniently located right next to the stadium and features live music and the area's most famous (and deadliest) cocktail, the Yellow Hammer. If you find the crowd at Gallete's to be a little too rowdy (or the floors a little too sticky), not to worry, it's located right on the strip with plenty of other surrounding watering holes, one of which is sure to fit your style.